19-0001-02: On February 25, 2019 at approximately 12:00 p.m. (12 :00) a CSU student made a violent threat against the university while speaking with a professor. 3:44 p.m. (15:44) the Timely Warning has been cancelled. The student has been located and is cooperating with the police. The incident remains under investigation by CSU Police and The Director of Student Engagement and Conduct Office. 18-1769-09: On Sept. 25, 2018 at approximatley 1:36 a.m., there was a felonious assault committed on a male student in the administration parking lot. A weapon was displayed by the victim and suspect. Two students have been arrested and charged with multiple offenses. No serious injuries were sustained by either party. Case is closed. 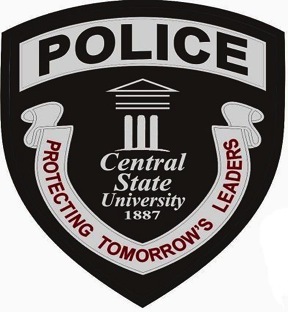 The Central State University was established to provide quality protection and professional law enforcement service to the University community. With community service as our foundation the mission of the Central State University Police Department is to contribute toward the quality of University Life through the maintenance of peace and harmony, the protection of life and property, and to enforce all federal, state, and local laws, as well as University rules and regulations pertaining to orderly conduct on its premises. In performing this mission, members of the department are mindful that the Constitution guarantees liberty, equality an Justice for all without regard to race, color, religion, age, gender, national or ethnic origin, sexual orientation, ancestry, marital status or differing abilities. We, the Central State Police Department are dedicated to providing a quality work environment and the development of its members through effective training and leadership. We recognize that maintenance of the highest standards of ethics and integrity is imperative for the continued improvement of police/community relations at Central State University. These high standards cultivate mutual trust and encourage members of the Central State Community to share responsibility for reducing the opportunity for criminal activity. We strive to attain the highest degree of ethical behavior and professional conduct at all times. The Department provides service twenty-four hours a day, seven days a week, 365 days a year to the entire population and property of Central State University campus. Central State University Police Officers receive their legal authority from section 3345.04 of the Ohio Revised Code. They are sworn and vested with full law enforcement powers and responsibilities, certified by, and meet the training requirements set forth by the Ohio Peace Officers Training Academy for the State of Ohio (109.77 ORC).